Vampyrrhic is 441 pages long and the story is set in the North Yorkshire town of Leppington, which is not far from Whitby. There are four central characters in Vampyrrhic, but the main one is probably Dr David Leppington. Readers meets him for the first time in chapter one, as he travels by train back to the town of his birth. As you might have gathered, the town its name from his family (in the story anyway). David has few memories of Leppington, he was just six years old when his mother and father left the town and moved to Liverpool. Now he has been offered a chance to take over from the town’s doctor when he retires. David is in two minds about doing this and has decided to pay a visit to the town that he left over twenty years ago, while he makes up his mind about the offer. It will also give him a chance to visit his uncle George. Unbeknown to David, there are dark forces at work in Leppington and creatures of a singularly unnatural diet move beneath the town’s streets. But not rats. For some strange reason, there are never any rats in Leppington’s sewers. The other three central characters in Vampyrrhic are Electra Chanwood, Bernice Mochardi and Jack Black. Electra is the proprietor of the Station Hotel. She is quite a striking woman who once had a promising media career ahead of her, but she returned to Leppington after her father’s death and never managed to pick up either her career or her old life. Like David, Bernice is a guest at the hotel. She works at the local leech farm—now, there’s a nice profession for a young lady. Last, but not least, there is Jack Black and he has to be one of the most unlikely heroes you could imagine. He is a hero though, as well as being a man of rather . . . unusual gifts. Of all the characters in Vampyrrhic, I must admit Black is my favourite. I enjoyed reading Vampyrrhic . The characters are very likeable and there is always plenty of things happening in the story. A lot of those things might not be very nice, but Vampyrrhic is a horror novel. For me, I think one of the most gruesome parts of the story was when the good doctor and his friends utilized various sizes of knives, and a saw from the kitchen, to cut off a vampires head. I personally did not find the scene offensive, but if you are a reader who is used to reading horror that is more to do with atmosphere than gore, you might be a little shocked by it. And, be warned, in this story, sometimes the things that go bump in the night are falling heads, and the heads start falling pretty fast when the gang rent a couple of chainsaws. Please don’t think that Vampyrrhic is all about blood and gore and mindless violence though. I am only warning you of what to expect in some parts of the book. 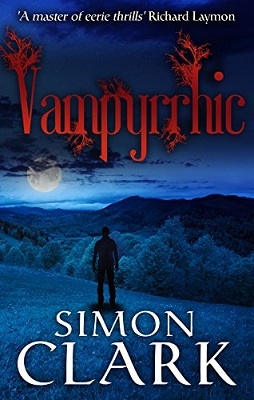 Vampyrrhic has a good storyline, the book is very well written, and there is a lot more to it than just the transition of vampires from the walking undead to being just dead and gone. I am not a fan of mindless violence and find gore for the sake of gore an incredible bore. I never once felt bored reading this book, it is an incredibly good read and I fully intend to read more if Simon Clark’s work.